That lovely saree you have got your eye on might feel so lovely if it is made out of silk and also it might be better at keeping you warm in chilly weather without compromising your fashionable panache. We are in the midst of winter season, and we have got still two months to go. It is wedding season – time to party with family and friends and look your best. During summer, silk sticks to your skin due to sweat and heat. So this fabric is quite suitable to be worn in cold weather. It regulates your body temperature and preserves your body heat in the cold. Extra layers do not do the trick always in winter – especially when you have got so many special occasions like weddings to take your fashion sense to the next level. When you drape the six yards of silk fabric, it makes you feel and look graceful and transforms elegance into personification. That is the power of silk sarees and it should not come as a surprise that there is a huge silk variety out there for every wedding function you wish to attend. 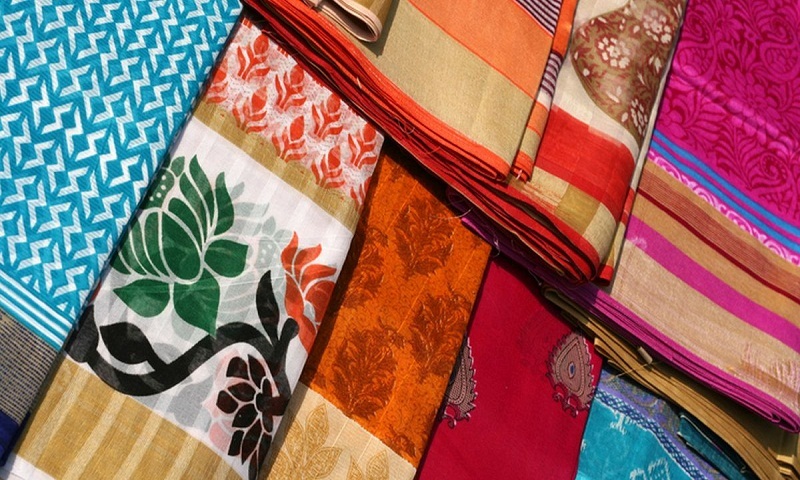 There is an array of silk saree variety. You can choose one perfect for you depending upon the occasion, time of the day and your personal taste. The sky is the limit as there are so many different types of silk available depending on the place it is being manufactured. South India is quite famous for different variety of silk sarees at attractive prices. You have pure silk saree centres in Mysore, Dharmavaram and Kanchipuram along with other notable places like Narayanpet, Pochampally, Uppada, Venkatagiri, Rasipuram, Coimbatore and some others with their own brands of silk sarees. Silk saree is one of the most versatile outfit that can be draped in different styles creating a unique look every time. This wedding season, adorn yourself with a wide collection of these lovely sarees actually meant for special occasions. Kanjeevaram Silk Saree: It is a traditional silhouette that adds elegance to your wedding get up. Wear the bold and beautiful colours that complement your skin tone. From bold colours to gold zari work, the broad borders and heavy blouses, everything speaks for its quality and exquisite richness. Wear them with heavy gold jewellery, a long braid with bun style adorned with white mogra gajras and high heels to secure some major fashion goals. The elegance and exclusivity of Kanjeevaram silk sarees is truly unmatched. Banarasi Silk Saree: Banarasi sarees are quite famous for their gold zari designs and motifs. Originally, it was woven only for royalty, as each saree was made with real gold threads. However, now most of the Indian women have been rejoicing flaunting their exquisite Banarasi collections on special occasions. Obviously, the threads are not of pure gold, so they are not as expensive as they were in ancient times of kings and queens. These sarees are adorned with gold zari bootas all over and exclusively in pallu making them look splendid. The silk is fine in quality and the opulence and grandeur of this variety is in its fine and intricate embroidery work. Available in an array of bright vivid colours as well as pastel hues, they are just perfect to be worn for wedding occasions. Each saree prides itself for being only one of its kind, designed and handpicked directly from their skilled weavers situated in Varanasi. With contrast heavy zari blouse, sleek elegant gold jewellery, decent make up, a high-heel golden sandals, you will steal the show. Kosa Silk Saree: These sarees are unique and spectacular in their own. Besides the beauty of Kanjeevaram and Banarasi, Bengal Cosa silk sarees are the most ancient one in India, draped by the women who have a great fashion sense and an aesthetic sense by heart. Sadly, these beauties are rarely spoken off. However they are real gems while indulging in a wedding season with a fashionable taste. This saree caters the best of women’s wish because of its fine quality of silk – a fine product by the weavers of Murshidabad West Bengal. The main feature of this saree is that it showcases colours of two threads interlocked in the weaving patterns on entire saree. These sarees have attractive meenakari work also on them. Featuring of gold prints makes them perfect for wedding times. Style up with bold eye makeup, a heavy low bun, a big red Bong bindi, big earrings, traditional necklace, golden flat foot wear and of course the Bengali style of draping the saree. Team it with a half sleeves blouse. Muga Silk saree: You can find the golden threads of Muga only in assam. These are made by a special kind of silk produced by a larvae that feeds on mainly two leaves. The resulting silk from this larvae is known to be the best. These authentic silk sarees are woven on a handloom and are designed with heavy golden zari work that adorns the whole body of the saree. The pallu is also designed intricately with traditional Assamese Miri patterns using golden zari yarns and the same Miri designs are done on the borders of the saree. The beauty of this saree lies in its natural undyed golden lustre retained for the base of the saree. You will look awesome in this gorgeous saree that is known for its extreme durability and natural golden shine. It was once reserved only for royalty. In fact, it is often compared to being as expensive as buying gold. Over the years, it managed to gain more popularity and has now become a coveted item for wedding wear. Additional colours are added via embroidery and zari work to make this clothing more attractive. Wear it with a pure golden sheen blouse, a low bun adorned with red roses, a big matching bindi, sleek gold jewellery and embellished flat foot wear. Bridal Mysore Silk Saree: You need not to be a bride to wear this saree. It can be worn on any festival or special occasion. This saree sports a South Indian touch and is one of the finest heavy silk saree to wear at a close wedding. It does not only suit to South Indians, but Marwadi, Gujarati, Bengali, etc. every woman can wear them sporting a rich, fashionable statement. Mysore silk is light weight, soft and render a smooth and glossy finish. These silk sarees come in bright colours to complement Indian skin tone. Made with pure silk, these sarees have long shelf life and gold zari does not fade even after decades. The mulberry yarns are interwoven with gold zari to create some of the most exquisite designs. Famous for the beautiful weave and finest silk, they are quite different from the other forms of silk sarees like Kanjeevaram and Banarasi. The pattern on the pallu is worth mentioning – it will be awesome for all women who want to look their best by sporting the Indian attire. The pallu sports a different metallic coloured pattern than the rest of the body. A delicate design adorns the rest of the surface. This saree will go hand in hand with a golden cut sleeve blouse, a chic gold neck piece, elegant gold jhumkies, hair style with side curls and high heels in metallic gold. Most Indian weddings are hosted in the night, so this variety of silk sarees is perfectly okay to go slightly over the top with zari and bright shades. Tie the saree low and complete the outfit with a kamarband to make the curves of the waist standout. It will look stylish and elegant and make you cynosure of all eyes. Today, contemporary urban women in India also prefer to wear silk sarees as they are not considered a traditional and sombre attire anymore. Thanks to the celebrities like Rekhaji – the legend in the film industry who attends all filmfare award functions and Bollywood weddings in marvellous silk sarees. Vidya Balan is also not far behind – the gorgeous actress showcases an exclusive range of her silk sarees at various occasions and many more. Today, the iconic saree is one of the most coveted dresses in any Indian wedding, as it allows a woman to look and feel stunning as well as sophisticated without trying too hard.